Often times we wonder what it’ll take to get from one point to another. We fail to realize how simple it is. All it really takes is a single moment. All it takes is now, the time that we’ve been given. We’re sometimes so stuck in concerning ourselves with what took place in the past, therefore causing us to doubt positivity or success for the future. We have to learn to take advantage of now. Learn to live in the moment, realizing what we do now has the power to change yesterday as well as tomorrow. There was a time in my life where I was literally stuck. No movement, no progression. This was a result of the fact that I wasn’t taking advantage of the moment I was given. Somewhere in my mind I had an idea of where I wanted to go, but because I focused so much on the past and failed attempts, I wasn’t sure how I’d get there. We may not have done everything right in the past. However, if we continue to focus our attention on how wrong we were, it’s possible that it’ll negatively effect what we do in the present or lack thereof. We miss out on opportunities when we are not taking full advantage of the moment. We can’t be concerned with what people say or what we see around us. If we do, it’ll cause us to miss the moment. Miss the opportunity that was placed in front of us. I’m currently without a laptop or computer. My laptop crashed twice and I lost a good amount of writing. I now do the majority of my writing from my phone. And I’ve been to the place where I thought to myself “I’m over this. I have to wait until I get a laptop to finish working on my writing.” But I realized I can’t think that way. Had I not taken advantage of my iPhone and began to share my work, I’d miss out on the opportunities that are coming and going to continue to come my way. Not only would I miss my opportunity to move forward, I’d also miss the opportunity to reach, encourage, and inspire others. 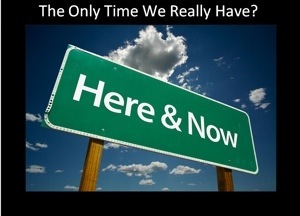 So I encourage you to take full advantage of “the now.” Live in the moment. Don’t allow circumstances, people, or situations to cause you to miss out on an opportunity that will further your success!